The stratospheric aerosol layer is prescribed in many Climate Models and Chemistry-Climate Models (CCMs), model simulations of the future, in general, and therefore do not account for interactions between the sulfur cycle and changes in climate. Therefore the understanding is very limited regarding how the stratospheric aerosol layer may be affected by future climate change, and how the stratospheric aerosol layer may drive climate change. Model intercomparison studies (CCMVAL) also reveal significant discrepancies in the volcanic climate impact attributed to the treatment of the volcanic aerosols in the chemistry and radiation calculations. In this respect global stratospheric aerosol models, which explicitly treat the formation and development of the volcanic aerosol, are an important step ahead. Up to now exist only a few global climate models with an explicit treatment of aerosol microphysical processes (Table1). Previous model intercomparison study in the SPARC Assessment of Stratospheric Aerosol properties (ASAP) Report indicates that model simulations and satellite observations of stratospheric aerosol extinction agree reasonably for visible wavelengths but not for the infrared. However none of the analyzed models could also reproduce the observed sharp vertical gradient in extinction between 17 and 20km in the tropics, which could be partially be explained by the relative coarse vertical resolution in the climate models of at least several 100 meters in the stratosphere. Although climate models have significantly improved over the last years, the simulation of the NH winter climate response after a large tropical eruption is still a challenging task for all climate models. This has recently been confirmed in the analysis of historic CMIP5 runs by Driscoll et al. (2012), who show that analogous to the CMIP3 models (Stenchikov et al, 2006) all of the analyzed CMIP5 models failed to capture the strong dynamical response in NH winters following large tropical eruptions. Differences also exist with respect to the dynamical response in the SH between model and observations for the most recent eruptions. A general problem is that large volcanic eruptions are rare and therefore provide poor statistical constraints. This also affects the comparability of diverse model results. Recent climate model studies suggest that very large eruptions or a clustering of major eruptions might represent a substantial climate forcing over decadal to multi-decadal time scales. In these studies key variables in the Atlantic climate system, such as sea ice and the AMOC are found to be quite sensitive to volcanic forcing. A sound assessment of the role of volcanoes in the climate system on seasonal to decadal time scales in comparison to other forcing mechanism is therefore a prerequisite to understand future and past climate variability. Model Type Domain Resolution Heter. Chemistry Aerosol Heating Institute Refs. The other working groups of SSiRC develop the process understanding to include the stratospheric sulfur budget and aerosol layer as interactive elements in global climate models. This working group will develop fast parametrization for these processes and implement them in the global models. These will then be used to assess the role of the aerosol layer in climate variability and change. GeoMIP is an endorsed community coordinated project, as designated by the Working Group on Coupled Modeling (WGCM) of the World Climate Research Programme (WCRP), as the experiments are synergistically built upon the CMIP5 experiment framework. The joint initiative GeoMIP seeks to better understand possible implications of geoengineering therby focussing on Solar Radiation Management (SRM) schemes.. A set of simulations with different global circulation models, mainly coupled to an ocean model were defined (Kravitz et al. 2011). Two experiments are related to stratospheric sulfate aerosol the G3 and the G4 experiment. The AeroCOM project is an open international initiative of scientists interested in the advancement of the understanding of the global (tropospheric) aerosol and its impact on climate.A large number of observations (including satellite and surface stations) and results from more than 14 global models have been assembled to document and compare state of the art modeling of the global aerosol. A common protocol has been established and models are asked to make use of the AEROCOM emission inventories for the year 200 and preindustrial times. 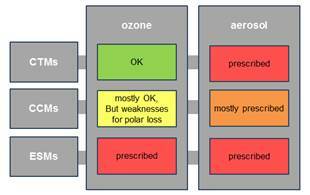 The overall goal of AEROCOM is to document understand the differences apparent in current global aerosol models. It seeks answers to key modeling questions, such as consequences of differences in source strength, vertical transport or removal, water uptake, aerosol composition aerosol size broadband radiative transfer on the overall quality of the aerosol simulation and estimates of the direct radiative effect of the aerosol. A joint IGAC / SPARC Chemistry-Climate Model Initiative (CCMI) was established to coordinate future (and to some extent existing) IGAC and SPARC chemistry-climate model evaluation and associated modeling, At the IGAC / SPARC Global Chemistry-Climate Modeling and Evaluation Workshop (Davos, May 2012) the IGAC and SPARC CCMVal communities have jointly defined a new set of reference (REF), sensitivity (SCN) and process-study (PRO) simulations. These simulations are carried out in support of upcoming ozone and climate assessments(e.g. 2014 WMO/UNEP ozone assessment.) and will help to answer emerging science questions as well as improving process understanding. A white paper summarizing the goals of the CCMI, including a more detailed summary of the workshop, will be published in the IGAC and SPARC newsletters in early 2013. The global modelling component of StratoClim will exploit recent advances in conceptual understanding, together with advances in modeling to quantify measures of the interactions between the stratosphere and the troposphere within the coupled chemistry (gas phase and aerosol composition) and climate system. The research methodology will include exploitation of existing (and soon-to-be-produced) data sets e.g. the CMIP5 integrations (IPCC); the REF-C1 (hindcast 1960-2010), -C2 (forecast 1960-2100), and -C3 (nudged run 1980-2010) simulations which will be performed for the upcoming WMO ozone assessment (SPARC/IGAC CCMI activity); PMIP, etc. It will further include new integrations and sensitivity studies performed using the state-of-the-art CCMs and ESMs. It will finally make use of improved process treatments developed within the project including, in particular, the results of field activities and connected process studies. A range of simpler mechanistic models to explore ædownward controlÆ, exploiting will be used as well as global models including newly-developed, simplified ozone schemes and global models run in ænudgedÆ mode. Three areas of work will address the issues of (i) entry pathways into the stratosphere, including climate-driven changes in transport and tropospheric processes (ii) changes in the upper troposphere and lower stratosphere; (iii) the impact of changes in the stratosphere on tropospheric climate an composition. It is planned to improve the treatments of sulfur fluxes into CCMs and to address the climate sensitivity of the models with respect to the different sulfur treatment.Special emphasis with respect to SSiRC will be place on changes in the aerosol loading of the stratosphere and its impact on stratospheric circulation and chemistry. Furthermore the impact of volcanic eruptions or anthropogenic sulfur emissions in the past and under future climate will be analyzed. The focus of the schemes developed in the process modeling working group will be on a detailed representation of aerosol relevant processes in the high resolution Lagrangian models. These schemes will be too numerically demanding to be implemented into standard IPCC climate models. But a fully interactive stratospheric aerosol layer is needed in these models to account for the mutual interactions between stratospheric aerosol changes and climate change and hence to account for the role of the stratospheric aerosol layer in climate change scenarios and predictions. 5.3.2.6. Provide a numerically efficient scheme for including an interactive aerosol layer in fast Chemistry Climate Models (CCMs) and in IPCC climate models (AOGCMs). In this working group we will develop FAST-Aer, a fast parameterization for the stratospheric aerosol layer for climate models. FAST-Aer will be based on the detailed schemes implemented in the process working group and will be validated against these detailed schemes. FAST-Aer will be implemented and tested in an AOGCM with fast stratospheric chemistry that is currently under development in the FAST-O3 project in the MiKlip program. Based on first runs with this model system, the role of the stratospheric aerosol layer in climate variability and change will be assessed. When the next volcano erupts, large changes in the earth system are to be expected .In the case of a large Pinatubo size volcanic eruption, any decadal scale climate prediction neglecting the effects of this eruption will have very limited forecast skill. In the frame of the German BMBF MiKlip project ALARM a volcano module for medium term climate predictions system is developed and the climate effects of large volcanic eruptions on decadal time scales dependent on the initial state of the ocean, the season and the location of the eruption are investigated. The role of dynamical coupling between stratosphere and troposphere for the medium term climate response to large volcanic eruptions will be addressed by analysing the simulated dynamical response to the Pinatubo eruption depending on the representation of volcanic aerosols and c) the dynamical response to volcanic eruptions for different states of the atmosphere-ocean system. UKCA is collaboration between and the UK Met Office and the three Universities Leeds, Cambridge and Oxford, involving the UK National Centre for Atmospheric Science. The main aim of UKCA is to build and scientifically evaluate a new UK community atmospheric chemistry-aerosol global model suitable for a range of topics in climate and environmental change research. One of the principle science targets in UKCA is to have a coupled tropospheric-stratospheric chemistryûclimate model with an aerosol microphysical module. The aerosol-chemistry sub-model is implemented within the Met Office climate model HadGEM with high-top (up to 80km) and low-top (up to 40km) versions and higher and lower horizontal resolution versions at N96 and N48. The aerosol microphysics module implemented is the two-moment modal GLOMAP-mode scheme, as described in Mann et al. (2010, GMD) and Mann et al. (2012, ACP), based on the original sectional GLOMAP-bin scheme (Spracklen et al., 2005, ACP; Spracklen et al., 2010). 5.3.2.9. UK project: The lower stratosphere: interactions with the tropospheric chemistry/climate system. A joint Cambridge-Leeds project entitled "The lower stratosphere: interactions with the tropospheric chemistry/climate system" ran from 2008-2011. It extended the UKCA model by including chemistry and aerosol schemes suitable for æwhole-atmosphereÆ use. The whole-atmosphere chemistry module "CheST" was developed and is applicable across both the troposphere and stratosphere. The aerosol microphysics scheme "GLOMAP-mode" has been adapted for the stratosphere. The stratospheric chemistry scheme from Morgenstern et al. (2008) has been extended to include a stratospheric sulfur chemistry scheme. A case study simulating the perturbation to the stratospheric aerosol from the Pinatubo eruption was carried out using UKCA with the stratospheric chemistry-aerosol-microphysics configuration in the high-top version (up to 80km) of the low-resolution (N48) HadGEM model (Emmerson et al., in prep, 2012). As part of MACC, the GLOMAP-mode aerosol microphysics module developed via the two projects mentioned above has been incorporated into the ECMWF Integrated Forecasting System along with the RADAER module for diagnosing the GLOMAP-mode aerosol optical properties (Bellouin et al., 2012, ACP). As part of MACC-II, GLOMAP-mode in the IFS will be coupled with the aerosol data assimilation system developed within GEMS/MACC and is being extended to couple with the C-IFS chemistry scheme developed within MACC (Flemming et al., 2009, GMD) and treat ammonium and nitrate components across the size modes. IPSL (Slimane Bekki) is also using IFS-GLOMAP to simulate volcanic aerosol with a case study based around the Pinatubo eruption. IPSL will also explore applying data assimilation of aerosol measurements during volcanic eruptions using IFS-GLOMAP based on MACC-II.